When fresh water rivers flow into the sea the concentration difference leads to a change in entropy. US researchers have developed a battery that generates power from that entropy difference. Yi Cui's team at Stanford University, California, extract energy with 74 per cent efficiency using manganese dioxide nanorods and silver electrodes1. 'What we have really demonstrated that this idea can work,' says Cui. Cui's team estimate that if the technology was used on all world's rivers this renewable energy technology would hypothetically generate 2 TW, or approximately 13 per cent of current global consumption. 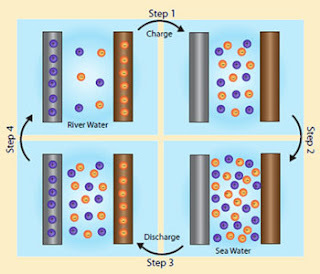 Entropy based power generation has been done before but is most reliably done today by separating fresh and seawater with membranes and as ions travel through the membranes they generate currents. The Stanford method extracts energy from the difference in concentration between two solutions by storing it chemically in batteries. 'The big pro is that they need no membranes, but they need a lot of surface area of electrodes' observes Bert Hamelers, head of the renewable energy group at Wageningen University in the Netherlands. Cui says that his nanorod electrode helps deliver that surface area. The battery extracts energy through sodium and chlorine ions' movements into and out of the crystal lattice of the electrodes. The battery discharges in seawater as chlorine is taken up by the silver electrode and sodium is taken up by the manganese dioxide electrode. The ions are released when the battery charges in freshwater. Because of the higher ion concentration in seawater, the electrical energy discharged is greater than that needed for the battery to charge in freshwater. 'The reason we can gain this energy is we change the electrolyte,' Cui says. Hamelers, whose membrane based approach for turning marine mixing entropy into electricity is 76 per cent efficient, welcomes the latest approach. 'As we cannot foresee all problems that might arise in future when developing these technologies, it is important to have more techniques available to harness this energy,' he says. Cui is excited by the battery's efficiency and hopes to further optimise its electrode materials and design. 'If we put the two electrodes closer I think we can get up to about 85 per cent,' he predicts.